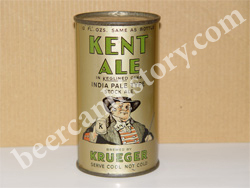 ——K is for Kent Ale: A brand that was canned early by Krueger Brewing with limited distribution. The numbers of on-grade Kent Ale examples are few in collections. Finding even one in dumps is a highlight, though a few diggers, such as Matt Menke BCCA #23654, have found Kent Ales on several occasions separated by over 15 years. Two grade 1/1+ Kent Ale examples were found in Georgia in late 1985; the collection of Joe Veselsky had one; another example was in a small group of opening direction cans found around 2001 written up in BCCA magazine, and a limited number of other on-grade examples have been saved. 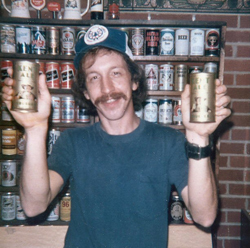 ---One of the best documented sequences from source to collections are the two Kent Ale cans found by a Robin Scott, a collector in Rome, Georgia who has helpfully provided the details of his top "find". 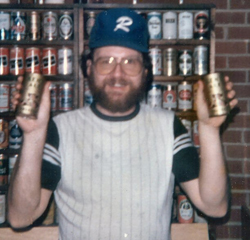 In November, 1985 Robin was checking a flea market and found a man selling beer cans who said he had just sold two old cans to a Coca Cola collector for 50 cents each. Robin asked about them and their description was intriguing: the cans were green, had holes punched in the tops, and the seller said during a renovation of an old building in the downtown area, he had found them between the floors. ---Immediately Robin thought "Krueger" cans since an old Bar B Q restaurant had photos from the late 1930's showing Krueger Beer cans stacked in pyramids in the windows. Robin was able to find the Coca Cola collector and was very surprised to see the rare Kent Ale brand. After trading for one, he contacted dealer Tony Steffen in Elgin, Illinois who offered $1200. Shortly later, he was in touch with Buffalo dealer Paul Michel who said he would pay $4000 for both cans. Robin contacted the Coca Cola collector who wanted a "Betty" tray in trade for the 2nd example. Paul found the tray, sending it with a value of $300, which resulted in Robin getting $3700 for both cans as the result of his persistence and negotiating work - a top end price at the time when very few cans had ever sold over $2000. ---Paul Michel sent both cans to David Stark who picked one, sending the other to Gene DiCicco. As of early 2008, one Kent Ale was part of the Stark collection sale and the other is in a mid-western collection. Copyright © 2008-2012 www.beercanhistory.com, All Rights Reserved. Last modified January 8, 2012.